Finishing a basement in Vermont is the perfect way to add resale value and usable space to your home. Our basement finishing contractors located throughout the state of Vermont are highly trained and can give you a free basement finishing inspection and estimate. 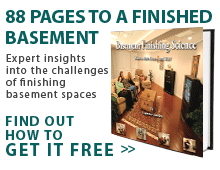 We have provided basement finishing services for many homeowners throughout Vermont. Our basement finishers provide high-quality products including basement wall panels, basement floors, basement windows and energy-efficient dehumidifiers to make your basement feel as comfortable as the rest of your house. We also have basement ceiling tiles, and our SunHouse window wells can bring more natural light into your basement. Our Total Basement Finishing system will make the whole basement feel warm, dry and clean. Our basement finishing contractors are a part of the trusted Total Basement Finishing network, which is made up of professionals throughout the country, including the state of Vermont. Give us a call or contact us online today to get a free basement finishing quote and let us make your basement look beautiful! There is a local basement finishing contractor in our network serving the entire state of Vermont including Burlington, Montpelier, Lowell and Wilmington.